Call me crunchy, but I love me some granola. Granola and fruit. Granola and milk. Granola and yogurt. Granola just plain ole’ by itself. Love it. 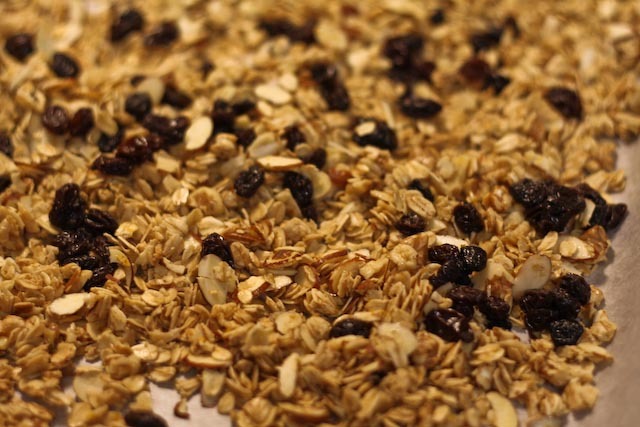 What I don’t love about granola – at least the store-bought kind – is the price. So, as often as I can (as it’s a bit of a process), I try to make my own at home. It’s really easy, quite healthy for you, and save you boatloads. I’ve adapted my recipe slightly from the one in Super Natural Every Day by Heidi Swanson (of 101 Cookbooks fame). 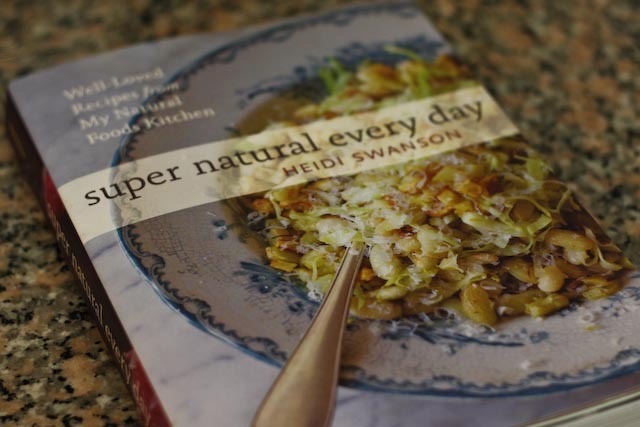 Her recipes are amazing and she has tons of ideas for making your cooking more natural and healthy – everyday. Hooray! Check it out if you haven’t done so already. 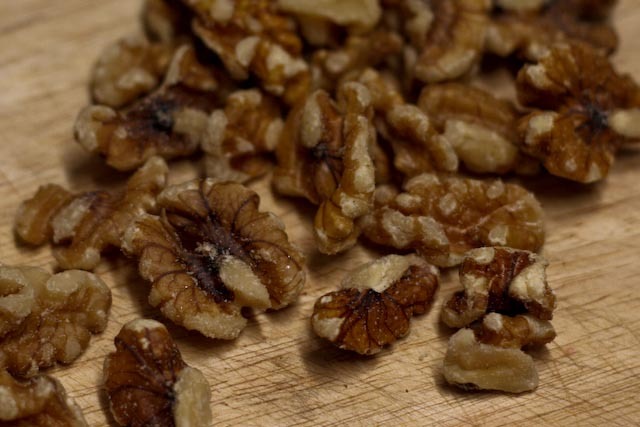 I like to use walnuts and slivered almonds in my granola because I really like the flavors and different textures they bring to the mix. Feel free to substitute whatever nut varieties you choose. Or skip the nuts altogether! Everything except the dried fruit is mixed together before baking. You can add the fruit (raisins, craisins, etc) at the beginning and bake for the full amount of time, but I find that raisins , if baked for too long, will turn really hard and will stick more easily in your teeth. No one likes that! So I usually add them in with about 10 minutes left to bake so that they get slightly cooked but not too hard to eat. And voila! 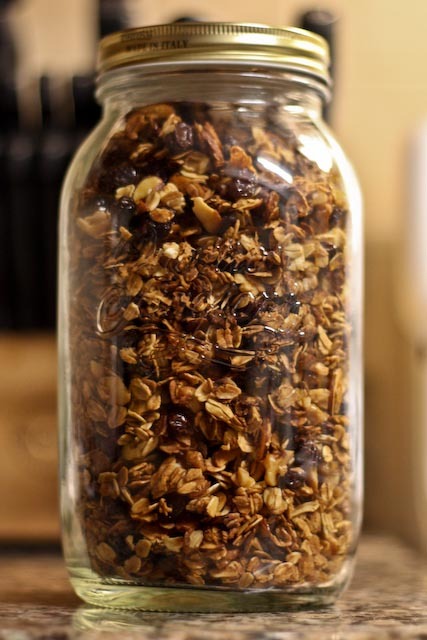 Easy, cheap, and delicious homemade granola. Be sure to store it in an airtight container or zip top bag to keep it crispy. I keep mine in a large Italian mason-style jar along with the rest of my grains like quinoa, barley and brown rice. Preheat the oven to 275°F with racks on the top and bottom thirds of the oven. Line two rimmed baking sheets with parchment paper. 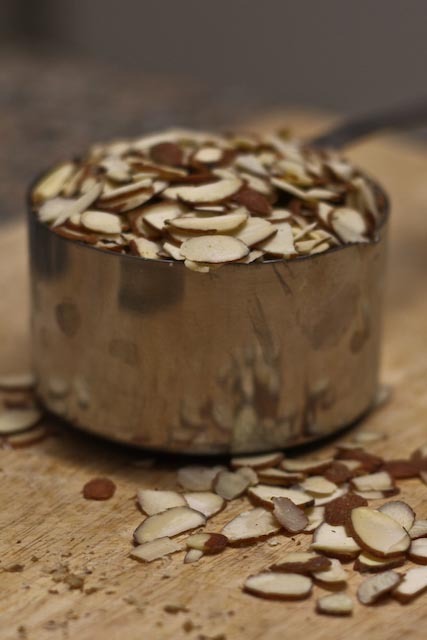 In a large bowl, combine the oats, walnuts, almonds, sea salt, and orange zest. Heat the butter in a small saucepan over medium low heat and stir in the agave. Whisk until combine and the butter is melted then pour over the oat mixture. Stir to ensure that everything is well coated. Divide the mixture evenly between the two baking pans and spread into a thin layer. Bake, stirring a few times, for about 40 minutes. Remove from the oven and sprinkle the raisins over the baking sheets. 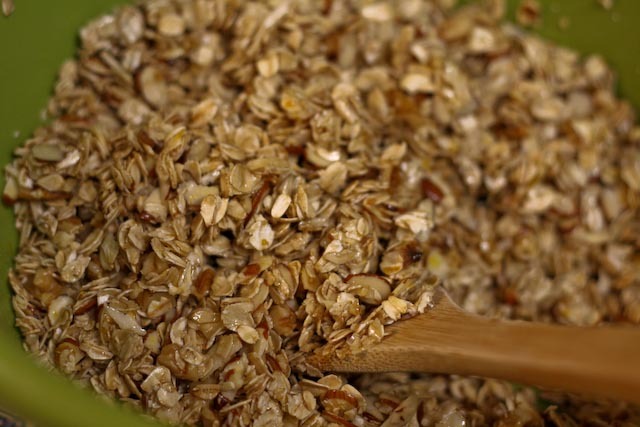 Stir the granola and bake again for another 10 minutes, or until the oats are golden brown. 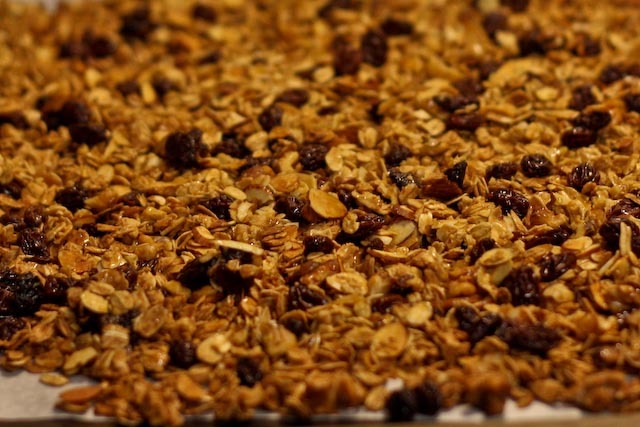 Remove from the oven and press down the granola with the back of a spoon to help it clump together. Drizzle with honey and let cool. Store in an airtight container.